This personalized napkin ring Mother’s Day craft is really easy to put together and it’s full of thoughtfulness so Mom will be sure to love it! Getting started is easy, you’ll need two separate colors of paper – one for the center of the flower and one for the petals. Cut out a small round piece for the center of the flower and cut out petals in the other color. Glue or tape the petals to the back of the circle center. You’re then ready to start writing down thoughtful notes for Mom. This could include things you love about her, things you’d like to thank her for, things that she does to make you laugh, etc. I’ll include some ideas for inspiration below the photo. Once you’ve written a message on every petal, you can glue this to a ribbon to tie around a napkin and use as a personalized napkin ring. 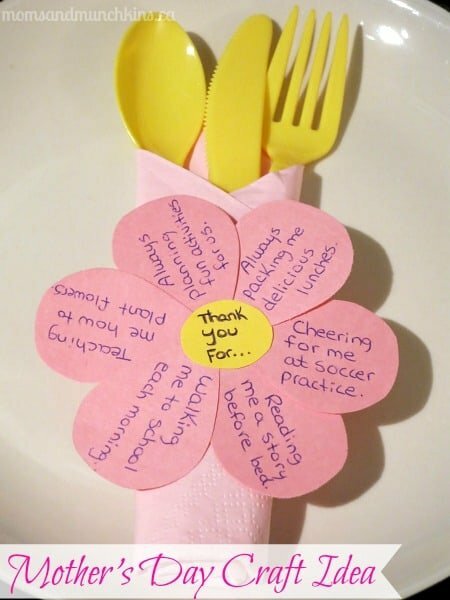 What would you like to thank your mom for? For more fun Mother’s Day craft & activity ideas, visit our special Holiday Fun page and scroll down to May for the Mother’s Day section. We’re always adding new ideas for family fun & holidays. Follow us on Facebook, Twitter, Pinterest and Bloglovin’. I used your tutorial and wrote about it on my blog. Thanks for letting me know – I’ll head over to check it out.